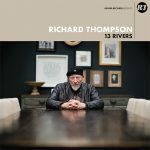 13 Rivers, the new album from Richard Thompson, was released one week ago today and has garnered critical acclaim already with many reviewers regarding it as one of Thompson’s best albums in recent years. You can read some of the review highlights below and follow the links to the online versions for the full reviews (where available). Richard Thompson returns to the UK next month for a run of 19 dates which will see him performing at venues including Liverpool Philharmonic Hall, the Barbican Centre in London, The Sage in Gateshead and many more. You can find all of the dates and ticket details here.